In what’s become a tradition of sorts, several times a year I venture off to Corvallis to visit my family, reconnect with nature and reset my personal frequency. 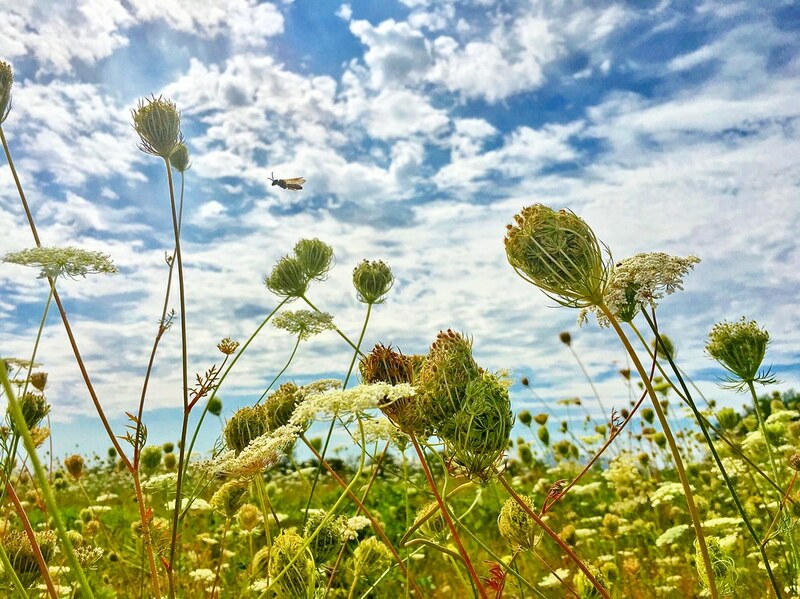 While the school year brings a hearty amount of hustle and bustle to the mostly agricultural community, the Summertime brings sleepy months of stunning sunsets mixed with fantastic weather; and the food and drink? Thanks to the Oregon maker spirit and an influx of former California natives, they live up to the state motto ‘Alis volat propriis‘, and they’re getting better all the time. This romp around Central Oregon was absolutely different than anything else; first and foremost, after three years of planning – Danny and I were finally getting married, and secondly – it was fueled with the energy of the Total Solar Eclipse. Though there were some fantastic moments over the entire week, one of my personal highlights was actually after the weight of the big day had been lifted and we were just left with some key players, including my now husband, my dad, our officiant + best friend and my cousin. For one glorious afternoon, we enjoyed a double date of delicious drinks and rumpus games at Corvallis’ own Block15 Brewery and 4 Spirits Distillery. Though I’d been through the former haunt of 4 Spirits, I hadn’t had a chance to visit since their migration. Now conveniently located side by side, 4 Spirits and Block15 pack a hearty one two punch of some of the finest beer and rustic whiskey Oregon has to offer. When visiting, our friend reminded us of the old adage ‘Liquor before beer, you’re in the clear’, so off to 4 Spirits we went! 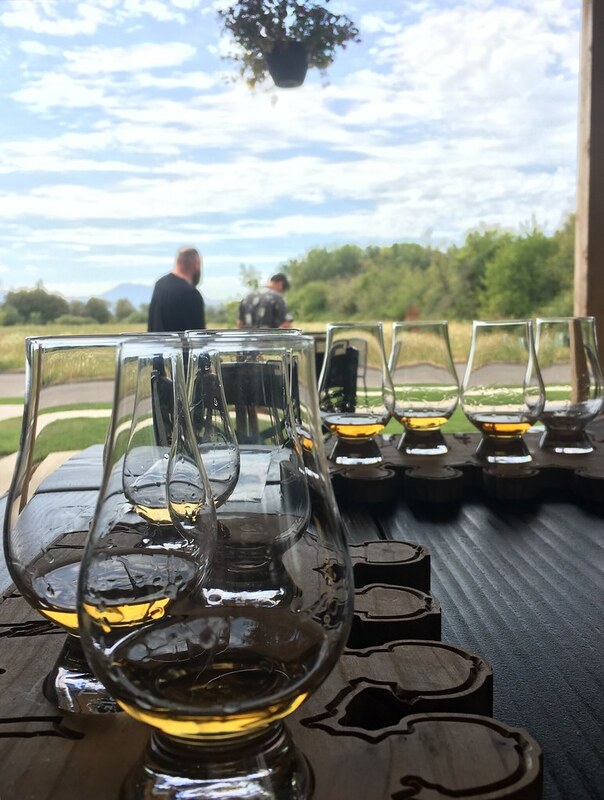 Boasting a bevvy of Rums, Whiskeys and a signature Vodka, at it’s heart – 4 Spirits is a philanthropic venture, giving back to both homegrown programs from Oregon and initiatives in Wyoming, Montana and Washington. To taste a flight of four hearty half ounce shots, it’s only $5 – and if a member of you group happens to purchase a bottle, then the rounds are on the house. For the whiskey drinkers, there’s the Bourbon Whiskey with delicious undercurrents of vanilla and caramel, the American Whiskey, and Single Malt; for the rum-ophiles, there’s a silver rum, a light rum, a dark rum, and my personal favorite (and take that to heart, because I’m not a rum drinker) – their habanero spiced rum; and last, and least, their vodka – which was great, but that’s not why one goes to 4 Spirits. To add to their cornucopia of liquor, the new spot also offers a kitchen with munch worthy snacks like Stuffed Tots and fries, full sized fare ranging from burgers and sandwiches to pizza, plus a lawn version of Yahtzee, appropriately called Yard-zee. After loosening ourselves up with liquor, we were off to the second stop on our double date – Block15. Literally a hop, skip and a jump across the parking lot sat Block15’s Brewery and Taproom, not to be confused with their restaurant located in the heart (aka. within the four blocks) of Downtown Corvallis. For about $5-8 depending on your tastes, you can get a flight of five tasty beverages. 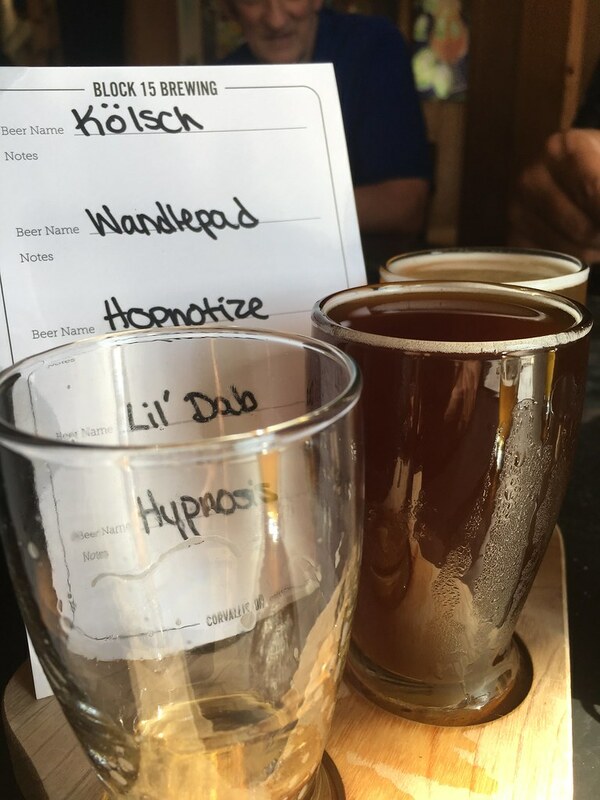 My favorites was Hopnotize, Wandlepad and the Lil’ Dab, a cannabis infused drink – cheers to you, Oregon. Hypnosis was on the heavier side, so if you’re of the type that likes to chew their beer – this is your best bet. Though their food menu isn’t nearly as deep at the Taproom as it is at their Restaurant, the kitchen still produces some bomb eats including a DIY charcuterie board, hearty sandwiches and a hands down the best bier pretzel I’ve ever tasted. For anyone who happens across Oregon’s Central region or finds themselves in Corvallis, between these two locations you simply can’t go wrong. So hop on the good foot, and do the drinks thing. ♥ I'm a spunky girl with a big heart and an open mind. I can't ride a bike and dislike capital letters. I'm slightly obsessed with my kitties - Daisy, Stella, Loki, Marley and Lucky - but I bet if they were yours you would be, too. I laugh all the time - loudly and mostly at myself. my favorite things include, but aren't limited to: fabulous people, my fantastic husband, traveling, live music, social media, a good read, working out, furry friends, the Golden State Warriors, photography, and sushi. Everyone, including you, looks like an animal - and I won't hesitate to tell you which one. I was born and raised in the 650, spent some of the best years of my life at UCSB as a gaucho and for over a decade I was a proud angelino; I effing loved└A, but it was ready to fly so I’ve spread my wings to the Pacific North Wonderland and can’t wait to dive into new adventures!